The company employs certified ASE master technicians to present a professional, respectful, knowledgeable atmosphere. 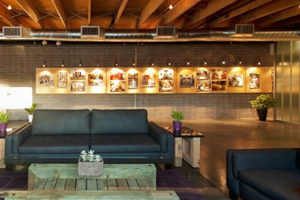 An urban interior with art, plants, and sleek couches: perfect for Wine and Women Wednesdays, but unique in an auto-shop. Customers entering 180° Automotive are greeted by what appears to be the lobby of an urban coffee shop. From the soft lounge seats surrounding a shag rug to the local art adorning the walls, this full service automotive repair shop promises to be a unique experience. Owner Bogi Lateiner built her business on being the antithesis to the auto shops she knew. Her first car in high school was an old, cheap Volkswagen Bug in need of serious repair and restoration. As she sought out a place to get it fixed, she encountered a disappointing, recurring theme. “I hated the way I felt when I brought my car into shops. I felt like I was a little girl with a huge target on my head, and even if I wasn’t being taken advantage of I felt like I could have been because there’s so much you don’t know,” Bogi said. Turned off by these experiences, she decided to become her own mechanic. She found independence in learning how to care for her own car through a high school auto-shop class and a lot of self-teaching. Soon, she was doing more than just repairing her Bug, she was rebuilding it! Inspired by the gratification of building something so complex with her hands, Bogi looked into a career as a car technician. Bogi Latener, owner of 180° Automotive, is proud to be a female business owner in a male dominated industry. Bogi battles the stereotypical notions that mechanics are uneducated or stuck in a bad job. She used that as her fuel to build a shop challenging those beliefs, determined to be more welcoming to her customers than her local garage had been to her. After completing her college career and leaving with a law degree, Bogi became the owner of 180° Automotive. “When people come to my garage, they know they will be met by an outgoing woman who is interested in presenting a professional, respectful, knowledgeable atmosphere,” Bogi said. In addition to being informed and treated with respect, Bogi’s customers can expect high quality repairs on their vehicles as well. 180° Automotive’s technicians all studied and graduated from a trade school and complete 40 hours annually of continuing education to stay current with today’s high-tech vehicles. 180° Automotive is especially proud to employ certified ASE master technicians, a status earned through at least two years of relevant hands-on experience and a series of technical tests. In keeping with her founding principles, Bogi also facilitates a strong bond to the community at 180° Automotive. She invites local artists to display their photography and paintings at her shop, promoting their work and enriching the facility with art. She brings women together through Wine and Women Wednesdays, a completely car-free social event for women to gather, socialize and network. She also fundraises throughout the year for food banks, refugee centers and scholarships for women to go to tech school. Bogi believes strongly in empowering women and promoting their education and success in the automotive industry. 180° Automotive hosts regular Women’s Car Care Classes during which Bogi teaches women important car care basics including changing tires, checking fluids, belts and replacing windshield wiper blades. “Learning automotive skills can be a very empowering thing and it’s great to watch the light go on when they learn something new,” Bogi said. Women of all experience levels are encouraged to attend 180° Automotive’s next Women’s Car Care Class on Saturday, March 11. To learn more about 180° Automotive, click here!